Do you want the Best At-Home Test to see if you have a rotator cuff problem? Do you have trouble reaching back into the back seat in the car? Does your shoulder bother you when you sleep on that side at night? Do you have problems reaching? Up on the shelf? Or behind your back when you’re getting dressed? Shoulder problems are common at any age, but specifically between the ages of 35 and 55 years old. There’s a problem that commonly occurs in the shoulder. The big, fancy name for it is: shoulder impingement. Shoulder impingement looks like this. Do you see the bone sticking out called the “acromion”? 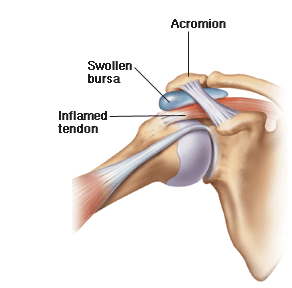 Under the acromion is a small space and in that space is on of your rotator cuff muscles (the supraspinatus). What happens is as we become “more seasoned” in life.. and have more birthday candles on our birthday cake, that space can close down. In the beginning it can cause inflammation and lead to “bursitis”, “tendinitis”, and “arthritis”. Eventually it will begin to cause fraying of the tendon and then a partial tear. If left untreated, it can cause a full rotator cuff tear. Luckily, if you have shoulder pain and early signs of problems, there are steps you can take today to stop that from happening. But first we want to see if this is really what you have going on. With the painful arm, reach behind your back and up between your shoulder blades as far as you can. Note if you have any pain, tightness, or achiness. Then with the non-painful arm, do the same thing. That’s the #1 Best At-Home Test I can give you to see if you’re having trouble with your rotator cuff. If you’re looking for answers and looking to get back to normal again… call Full Potential Physical Therapy and set up a FREE consultation.